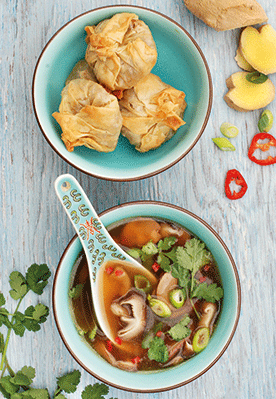 A delicious soup – using mushroom stems and tantalising Thai flavours to create a wonderful base for your soup. Serve with these easy to make crispy wontons. For the wontons: These wontons are quite small and delicate. Make sure all of your filling ingredients are finally chopped to make sure you get a good mix of flavours in each wonton. 1. To make soup: Take stalks out of shiitake mushrooms and reserve caps. 2. Put stock into a saucepan together with the shiitake stalks (add stalks from shiitake mushrooms used in wontons), lemon grass, ginger, lime juice, lime leaves and shoyu. 3. Bring to the boil and simmer for 15 minutes. Strain, reserving liquid and discarding vegetables. Return liquid to pan and reheat. 4. Add sliced shiitake mushroom caps to the pan and simmer for 10 minutes. Meanwhile sauté the garlic and sliced chestnut mushrooms in 2 tablespoons of oil, stirring all the time, until the mushrooms are softened. Add mushrooms and garlic to the pan together with sweet chilli sauce. 5. To make the wontons: Preheat oven to 180°C/Gas 4. 6. Mix first six wonton ingredients together. Melt the vegan margarine. Cut filo into 12 10cm squares. Make an 8-pointed filo star by placing one square of filo on your work surface, brush with a little melted margarine then place a second square on top rotated 45˚ to create your star. Brush with a little more margarine. 7. Put 1 tbsp wonton mixture in the centre of the filo star and draw up edges and twist to make a money bag. Brush the outside with more margarine. Place on baking tray lined with baking parchment. Repeat until you have 6 wontons. Bake in oven for about 7-10 minutes until golden and crisp. 8. To serve: Reheat soup and pour into 6 warmed small soup bowls. Just before eating, place a wonton in the centre of each and garnish with coriander sprigs and red chilli.